Someboooody is on spring break, so she is able to post mid-day - lucky me! Milton likes having his Momma Dog home too. 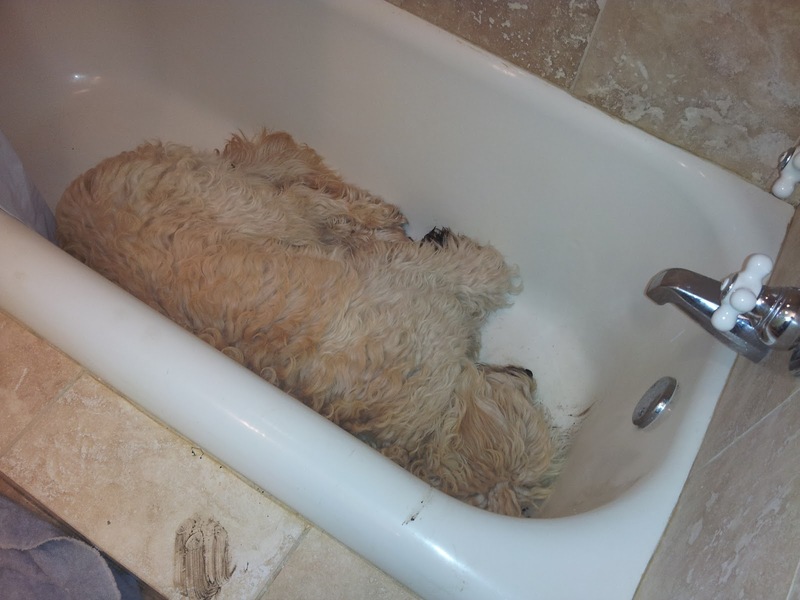 Well, some dogs have a total aversion to the bathtub, but our doodle embraces it! He likes to cool off and enjoy a nice big gulp from the faucet. Sometimes he even naps in there. This photo was actually taken on the day of the hit-and-run. Milton creeped into the bathroom while I was painting the ceiling, and I think he was looking for a safe, cozy nook to be close to his Momma. He certainly found the perfect spot! Happy Monday, everyone! I hope it is off to a great start! I love him so much....so CUTE!